Anaïs Maviel is a vocalist, multi-instrumentalist, composer, educator and curator. 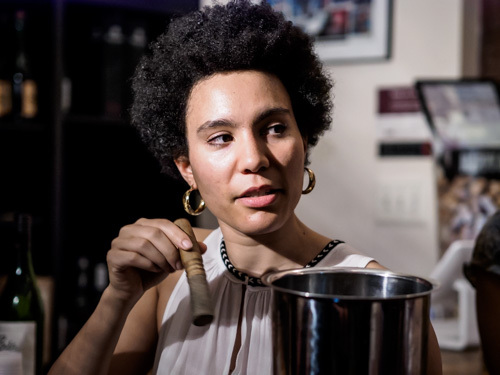 Her recent work has been focusing on the function of music, understood in traditional societies as essential to settling common grounds and addressing Relation. Inspired by Edouard Glissant’s reflections on Creolization, she has associated her work with the inextricable currents that move spaces and people between times and lands. The contemporary context of re-formulation of self, reality and social structures led her to question the use of language, and to explore its vibratory essence in music. Involved at the crossroads of mediums – music, visual art, dance, theater and performance art – she has been an in-demand creative force for artists such as William Parker, Steffani Jemison, Wally Cardona, Larkin Grimm, Cooper-Moore, Jawole Zollar to name a few. As a leader she is dedicated to substantial creations from solo to large ensembles, and to expanding the power of music as a healing & transformative act. Her path has led her to share her music extensively in New York, as well as in multiple places throughout North America, Europe and Haiti. Her solo debut hOULe, out on Gold Bolus Recordings, received international acclaim.